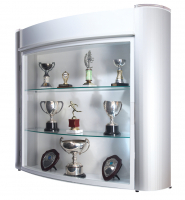 Trophy Cabinet Presentation and Display Showcase on sale now. Available as wall mounted and free standing, with optional extras including LED lighting and personalisation of logo and name. These units feature comtemporary design and smooth lines that will complement any reception or waiting area. Should you need any help, call our helpline number above Monday-Friday, 9-5.